Dreaming of a Carolina vacation with pristine beaches, world class golf courses, and afternoons on the water? This three bedroom villa is a premier family destination. 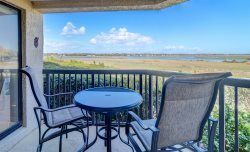 Overlooking the Shelter Cove Marina, Yacht Club Villas and centrally located to all of Hilton Head's amenities. Watch the yachts from huge windows or private decks. Stroll the Shelter Cove Boardwalk to quaint shops and local restaurants, and enjoy countless water sports right outside your door. Was a great place in a great location. Very clean and has all the amenities you could need! I just have to thank Cele and Deb for their outstanding customer service and patience with all my questions. The condo was absolutely amazing and we plan to come back and stay a little longer. So close to everything and the views were spectacular! I cannot thank them enough for making us feel at home. This condo is absolutely beautiful and so well appointed. The views are AMAZING. We sat out on the balcony everyday and took in the activity of the boats coming in and out and the restaurant Ella's was right out the front door, just steps away and the food and VIEW are amazing. Cannot wait to return! Thank you to the homeowners for sharing their beautiful home with my family.